This article assumes you don’t need much help with the basics of claiming or setting up any of these profiles. If you’re looking for technical help, click here for Google Business, start here for Angie’s List, and begin here for Home Advisor. Even if you’ve never set up any of these profiles before doing so is usually pretty self-explanatory—most of these platforms are designed to walk you through a series of basic forms and prompts. Be absolutely sure you're using the exact name, address, and phone number across every platform. Google checks your listing against other listings it finds on the web, and it doesn't like to find differences. Google has gotten a bit smarter about understanding that St. and Street are the same thing, but failing to be just this exact can still decrease your rankings. Service professionals should be especially vigilant, taking steps to ensure they enter the same service area information on Google and Home Advisor. Angie's List doesn't have a field for that, so you don't have to worry about it. The format won't be the same...Google lets you enter individual zip codes or a mile radius, while Home Advisor just lets you enter cities and townships. Still, you should make sure the information overlaps. Make sure all of it matches the information in your website footer, service area page, and "Contact Us" page. Every one of these platforms gives you the opportunity to add some photos. Do this on every one of them, even if you think your work isn't very exciting to look at. Contractors need credibility. Remember, the number one challenge for home services professionals is overcoming the trust barrier. Sure, these photos of water heaters aren't exactly riveting. But they do demonstrate Plumbing Right Now offers high-quality products, and it looks like they know what they're doing on installation, too. Of course, you should be vigilant about making sure your photos are crisp, clean, and beautiful. Google requires the most attention because it's the listing the majority of your customers will see. It also happens to offer the most options for business page optimization. If you do it right, your Google My Business page will be a direct source of traffic to your website as well as phone calls leading directly to jobs. Do it wrong, and you'll languish in position #42 while hearing the steady sound of silence from your phones. First, let's take care of the basics, shall we? Does your listing look like this? You are officially doing it wrong. Sorry, Pool Remodeling Specialist. I'm sure you're a lovely company, but I'm going to pick on you for a second. Let's take a look at all the problems on this listing, which was buried on Page 3 of Maps results for the search terms "Dallas Remodeling." No reviews. Already, this is a bad sign. No photo. Google just pulled a map and stuck it there. Looks especially bad when nestled between all these other contractors, who do have photos. Confusing category listing. Is this a pool contractor or a fence contractor? Does he do both? Impossible to tell. No website, no business hours, nothing. We don’t know a thing about it, and the only way to find out more is to make a phone call. Nobody wants to make a phone call. What is this photo? It looks like an apartment complex. There’s no pool in sight, and there’s no fence in sight. It could be a photo of some location this company serviced, but it’s more likely to be a photo Google pulled of that address. Plenty of contractors work out of their homes, but that’s usually not something anyone wants to call attention to for the sake of professionalism. More information is a happy thing when building a Google My Business Listing. Once you've taken care of that, deal with the fiddly bits. Here we are under the hood of a Google Business listing. As you can see, there's an option to "Enter AdWords location extensions phone." This is a newer feature which will allow you to show your phone number right on the SERP. Saving people time is a good thing. Some people don't want to click through to the home page. They're going to call the first person who shows up, even if it's an ad, because there's a perception which says Top of Page Contractor is Best Contractor. Use it to your advantage. Besides, this feature lets you track the number of phone calls you're getting from Google Ads or Google's Local Services Ads program and that's a great thing. Even contractors who spend all day in the field or work out of their homes probably aren't answering the phones at 11 PM. Go ahead and add working hours so people know when they can reach out to you for questions or quote requests. "Special" hours are for holidays. If you're a one-man-operation who is going hunting for half of November you might get in here and update that information so everyone knows to leave you alone while you're in the duck blind. A lot of home services professionals don't take advantage of this field because they think they don't have any offers. But even information which says you offer free estimates is appropriate here. Not everyone does, and it gives customers one more reason to pick up the phone. You're not going to charge me $75 just to look at my house? Fantastic! 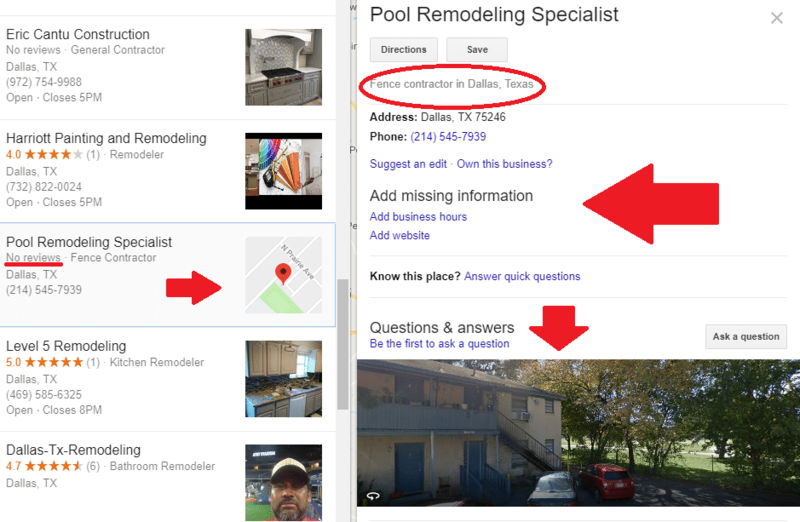 A lot of businesses aren't aware of one of the newest opportunities that Google has added to help local contractors amplify their business, Posts on Google. And they've neglect it as a result. That would be a mistake, however, because every Post shows up right in your Google Business Listing. Even posting once a week lets you tell customers you're an active, booming business doing projects all over town. It also lets you keep your photos fresh. This may require you to snap a picture at every job you complete, but that's easy enough to do. 30 seconds to snap it, 30 seconds to post it and write a little blurb about it. Easy. You can add other stuff as well, such as posts about your participation in home shows, or, as this contractor did, notes about some kudos you've received. Just make sure these posts always come with some sort of visual, or this technique loses effectiveness. A lot of contractors have a love-hate relationship with Angie's List. Their advertising sales practices can create some serious headaches, for example. On the other hand, many customers swear by it, and winning an Angie's List Super Service Award can be a nice badge of honor to add to your website. It's certainly not going away, no matter how you feel about it, and, as a result, it's smart to appear there and to funnel some reviews in Angie's direction. Here's how to win when you complete your Angie's List profile. At the top of an Angie's List profile page you'll find the basics: NAP info, service hours, and a general description. But there's some gold at the bottom of the page too, starting with the General Information section. The General Information fields offer some succinct, at-a-glance info that's important to customers. Make sure all of these entries are 100% accurate. Beside the General Information field you'll find the Services Offered field. This is a good opportunity to tell customers exactly what they can get from your company. It's also a good opportunity to make use of some keywords. You don't need to go overboard, but don't be tempted to skimp here. Really think it through. Go back to the Services pages on your website for some inspiration. If something the customer wants doesn't show up here they may keep looking. This is a great field, as it keeps customers who are never going to hire you from calling and wasting your time. Remember, repelling the wrong customers is just as important as attracting the right ones. Again, really think it through and don't skimp, because this is a prime opportunity to communicate vital information to your customers. Notice how this contractor added some pretty important information here. If you're looking for a quick bathtub reglaze or a liner replacement this is the wrong company to call. They want to come in and completely remodel your bathroom; they're not here to do a quick touch-up. Good to know. Make sure there is absolutely no overlap between the "Services Offered" field and the "Not Offered" field. Overlap means confused customers, which is the exact opposite of what you want. Home Advisor forces customers to go through a rather tedious Q&A process before they can even look at your listing. When you're filling out your profile on this site you should assume your profile is the first and last thing they'll see. Many aren't going to pass through to look at your website, because they've had to work so hard just to get this far. Thus, it's important to sell them right then and there by including every bit of information you can possibly include. Home Advisor profiles run on a series of bullet points. Some, like the "Services Offered" section, only allow you to pick from a handful of pre-offered options. Others, like the "Areas of Expertise" section, allow you to add whatever you want. Compare it to this contractor, who put a little more time and thought into his profile. Who are you more likely to hire? Contractor #1 basically just repeated the category information. Meanwhile, we know contractor #2 will both design and build your project, that they include tub to shower conversions, and don't mind a major remodel. Contractor #1 shared absolutely nothing about the product brands used, whereas Contractor #2 has told us they are an authorized dealer for two reputable manufacturers. Take the time to build out these bullet points so you give the customer everything they need to give you the call. Home Advisor also has a "Credentials" section where you can list things like your license number, your insurance information, and any professional memberships and affiliations you might have. Take advantage of them! Again, it's all about overcoming those barriers to trust. Home Advisor offers the standard company description which appears at the top of the page just like on other sites. Of course you want to use this section to tell a compelling story about what makes your company different. Write this like mini-Home page copy. But you also get an optional Business Profile section which can occur a bit further down the page. You can use this as a sort of mini-About page, offering additional details about what makes your company special. This contractor could have benefitted from a bit of proofreading, but this is still a great example. Check out what he's conveying here. He saw a problem in his industry and set out to solve that problem. He tells us how he did it. And he tells us what his personal philosophy is as well as his understanding of how to deliver a better customer experience. It's like he's already sitting across from us at our kitchen table, explaining how he's going to do a great job for us. His description tells us what he does, but his Business Profile tells us how and why he does it, to bits of information which make it easy to make a decision in his favor. To check out the profile this came from, see Iconium Builders on Home Advisor. Home Advisor also has space to include some offers. As with Google Business, you absolutely should take advantage of this space, even if all you've got to offer is a free estimate. If you offer senior or veterans discounts, this is a good place to include that information. These sites don't represent the sum-total of all the directory and review sites important to the home services industry. They're just some of the most important. So here are a few more thoughts on creating the "perfect profile" no matter where you go. Think long and hard before you leave any fields blank. More information is generally better than less information. Give at least as much thought to the copy on these pages as you’d give to your web copy. Consider getting a professional to write these fields for you. You don’t have much time to capture a customer’s attention. Claiming or creating all these profiles can be time-consuming. You might as well do it right so the time and effort brings you the benefits you’re hoping to receive by engaging in the exercise at all. Claiming or creating all these profiles can be time-consuming. You might as well do it right so the time and effort brings you the benefits you're hoping to receive by engaging in the exercise at all.